“I don’t think we are making waves, but we are making ripples. 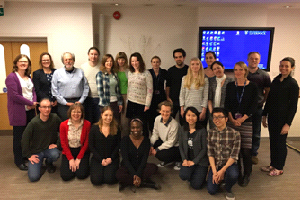 […] We are always looking to do more”, said Doug Altman when asked about the impact of EQUATOR, one of the most prominent initiatives aiming to improve the reliability and value of published health research literature. Doug Altman passed away on Sunday June 3, 2018, leaving a massive human and academic legacy behind. As early career researchers, we were incredibly lucky to have him involved in the network. Doug encouraged us on countless occasions to try to make waves, or at least ripples, investigating and challenging some of the major problems in health research, such as the selective publication of research findings, the (mis)interpretation of those findings, or the dominance of statistical significance as a mark of truth. Two of us, Melissa Sharp and Cecilia Superchi, recently had the opportunity to work with him for several months at the UK EQUATOR Center. He was a fantastic mentor, always willing to engage in discussions on how to make things better. With such gravitas and genius, he easily could have given you the answers but instead he humbly listened, and encouraged introspection and thoughtful debates. He had a great talent to make people think. We are extremely grateful to have the opportunity to know Doug, his brilliant mind and inspiring person. He was a promoter of a “revolution” in health research and, as early career researchers, we have the important task and big responsibility to continue his extraordinary work.